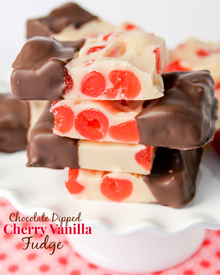 Chocolate dipped cherry vanilla fudge! Are you a fudge person? It’s so pretty and creamy and full of gorgeous cherries! I ate a piece, it was delicious, and I’m gifting the rest. This stuff is made for sharing, mmmkay?